Gilead Sciences, Inc. (Nasdaq: GILD) announced today its results of operations for the first quarter ended March 31, 2001. For the first quarter, Gilead recorded revenues from net product sales of $45.1 million, royalty revenues of $6.2 million and contract revenues of $6.6 million. Total revenues for the first quarter ended March 31, 2001 were $57.8 million, which represents a 21 percent increase over the same quarter in 2000. For the first quarter of 2000, total revenues of $47.7 million included net product sales of $36.3 million, royalty revenues of $8.0 million and contract revenues of $3.3 million. 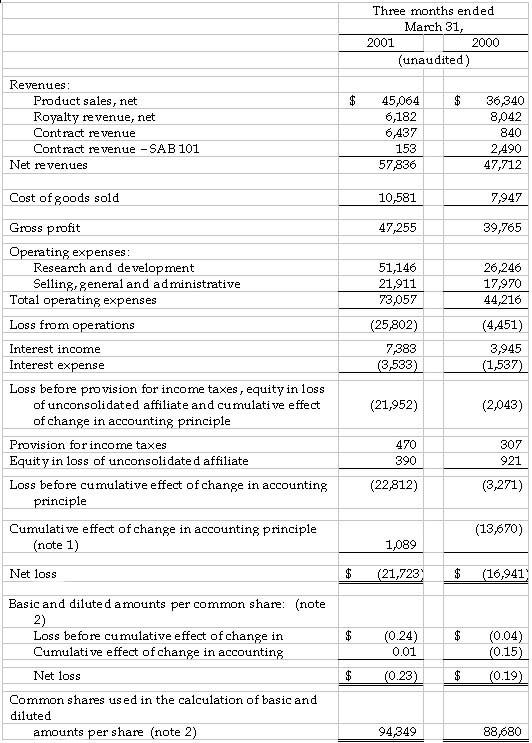 The net loss for the first quarter 2001, including the cumulative effect of a change in accounting principle related to the company's adoption of Statement of Financial Accounting Standards Nos. 133 and 138, was $21.7 million, or $0.23 per share. This compares to a net loss in the first quarter 2000 of $16.9 million, or $0.19 per share, including the cumulative effect of the adoption of Staff Accounting Bulletin 101 in the first quarter 2000 of $0.15 per share. 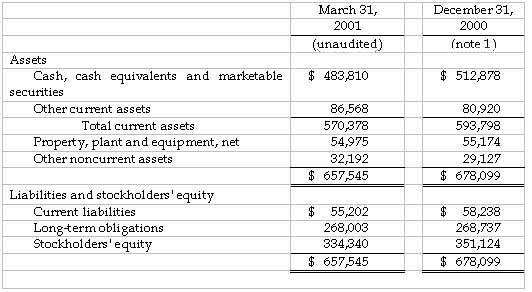 Excluding the effects of the changes in accounting principles, the net loss for the first quarter 2001 would have been $22.8 million, or $0.24 per share, compared to a net loss of $3.3 million, or $0.04 per share, for the same period last year. Net revenues from product sales were primarily derived from sales of AmBisome® (amphotericin B) liposome for injection, accounting for 93 percent of product sales for the first quarter of 2001. AmBisome sales for the first quarter of 2001 were $41.9 million, an increase of 21 percent compared to the first quarter of 2000. Excluding the impact of the decline in foreign currencies relative to the U.S. Dollar, AmBisome sales grew 29 percent for the first quarter of 2001 over the comparable quarter of 2000. In addition, Gilead recorded product sales of $2.1 million and $1.0 million from the sale of VISTIDE® (cidofovir injection) and DaunoXome® (daunorubicin citrate liposome injection), respectively, during the first quarter of 2001. For the first quarter of 2001, royalty and contract revenues resulting from collaborations with corporate partners totaled $12.8 million. These revenues include contract revenues for research and development projects, royalties on sales of AmBisome in the United States by Gilead's co-promotion partner Fujisawa Healthcare, royalties on sales of Tamiflu™ (oseltamivir phosphate) by Hoffmann-La Roche and royalties on product sales of VISTIDE outside the United States by Pharmacia Corporation. Research and development expenses for the first quarter of 2001 were $51.1 million, compared to $26.2 million for the same quarter in 2000. The substantially higher spending during the first quarter of 2001 was attributable in part to the recognition of $10.6 million of a $13 million up-front payment to Cubist Pharmaceuticals related to the European licensing agreement for daptomycin signed in January. In addition, Gilead's expenses associated with the Phase III clinical programs for tenofovir disoproxil fumarate (tenofovir DF) for HIV and adefovir dipivoxil for hepatitis B virus (HBV) increased significantly during the quarter, including the initiation of an early access program and clinical supply costs for tenofovir DF. Selling, general and administrative expenses for the three months ended March 31, 2001, were $21.9 million, compared to $18.0 million for the same quarter of 2000. Net interest income for the first quarter 2001 was $3.8 million, compared to $2.4 million for the same quarter in 2000. The company also reported equity in the loss of its unconsolidated affiliate of $0.4 million and $0.9 million for the first quarter ended March 31, 2001 and 2000, respectively. The losses are derived from Gilead's 49 percent interest in Proligo L.L.C., a manufacturing joint venture between Gilead and SKW Americas, Inc.
As of March 31, 2001, the company had cash, cash equivalents and marketable securities of $483.8 million, compared to $512.9 million at December 31, 2000. "During the past quarter, we made significant strides in our three therapeutic areas -- anti-infectives, antivirals and oncology," said John C. Martin, Ph.D., President and Chief Executive Officer, Gilead Sciences. "Importantly, the strong positive results from our Phase III study of tenofovir have enabled us to initiate expanded access programs and prepare our regulatory packages for marketing approval. We intend to submit our New Drug Application to the U.S. Food and Drug Administration and our Marketing Authorisation Application to the European Medicines Evaluation Agency for tenofovir DF in May." In the first quarter of 2001, Roche made Tamiflu available to pharmacies and hospitals in Japan for the treatment of influenza A and B in adults. Additionally, Roche submitted its application to European authorities for approval of Tamiflu for the treatment of influenza A and B in adults and children and the prevention of influenza A and B in adolescents and adults. Also in February, the Journal of the American Medical Association published a study in which Tamiflu was shown to be effective in protecting individuals from influenza infection when in contact with someone already infected with the disease. The study results demonstrate that Tamiflu, when taken once daily for seven days, can significantly reduce the rate of influenza infection in individuals exposed to the virus in settings such as households and universities. In the studies, Tamiflu was generally well tolerated, with the adverse events qualitatively similar to those seen in previous treatment studies, despite the longer duration of treatment, and no clinically relevant differences in safety profile were seen in the elderly patients compared to the younger population. Tamiflu continues to be the only antiviral neuraminidase inhibitor approved in the United States for the prevention of influenza in adults and the treatment of flu, in pill or liquid form, in adults and children one year and older. Although the incidence of flu was relatively light during this past season, Tamiflu was once again the number one prescribed neuraminidase inhibitor, with approximately 90 percent of the market in the United States. In February, Gilead unblinded 24-week data from Study 907, a 48-week Phase III intensification trial evaluating the safety and efficacy of tenofovir DF versus placebo in 552 treatment-experienced patients. Patients were randomized (2:1) to receive tenofovir DF (one 300 mg tablet, dosed once daily) or placebo in addition to their existing antiretroviral therapy. After 24 weeks of dosing, patients assigned to tenofovir DF or placebo were allowed to receive tenofovir DF for the remainder of the 48-week study period. The study achieved its primary efficacy endpoint demonstrating that tenofovir DF was associated with a statistically significant HIV RNA decrease in mean DAVG24 of 0.61 log10 copies/mL compared to a decrease of 0.03 log10 copies/mL in the placebo group (p<0.0001). Drug discontinuation at 24 weeks was six percent in both the placebo and tenofovir DF arms of the study. Additionally, through 24-weeks, the incidence of grade 3 and 4 laboratory abnormalities and clinical adverse events was similar between both arms. This multi-center study is ongoing at sites in Australia, Europe and North America. Gilead expects to present these 24-week data in detail at scientific conferences later this year. In January, enrollment was completed with 601 treatment-naive patients in Study 903, a randomized, double-blind, multi-center, active-controlled trial. This 48-week Phase III trial is designed to compare the safety and tolerability of two treatment regimens -- tenofovir DF, efavirenz and lamivudine (3TC) versus stavudine (d4T), efavirenz and lamivudine. Additionally in January, Gilead initiated early access programs for tenofovir DF. Programs currently are registering physicians and enrolling patients in the United States, France and the United Kingdom, and will open in Germany, Italy, Spain and Canada as regulatory approvals are obtained. This program will make tenofovir DF available in these countries to patients with advanced HIV disease and limited treatment options. Gilead Sciences and Cubist Pharmaceuticals signed a licensing agreement in January giving Gilead the exclusive commercialization rights to CidecinTM (daptomycin for injection) and an oral formulation of daptomycin in the European Union and Switzerland. In exchange for the exclusive rights, Gilead paid a $13 million up-front licensing fee and will pay milestones as clinical and regulatory milestones are achieved as well as a fixed royalty on future net sales. In March, Cubist Pharmaceuticals announced preliminary results from Study 9901, its first pivotal Phase III clinical trial assessing the safety and efficacy of Cidecin in the treatment of complicated skin and soft tissue infection resulting from Gram-positive bacteria. Study 9901 was an international, multi-center, randomized, double blinded study in 562 patients, aged 18-85 years. Cubist indicated that the primary endpoint of demonstrating equivalency to comparator agents was achieved as per the protocol previously reviewed by the U.S. Food & Drug Administration. In April, these data were presented in detail at the 11th European Congress of Clinical Microbiology and Infectious Diseases in Istanbul, Turkey. In addition, Cubist presented safety data demonstrating that the incidence of total adverse events was similar in both arms of the trial. In January, Gilead announced the appointment of James M. Denny to the position of Chairman of the Board of Directors. Mr. Denny has been a member of the Gilead Board since January 1996 and served as Chairman of the Audit Committee. Mr. Denny replaced Donald H. Rumsfeld, who resigned from the Board to serve the Bush Administration as Secretary of Defense. Last week, Gilead announced the appointment of Cordell W. Hull to the Board of Directors and as Chairman of the Audit Committee. He is the co-founder, Chairman and CEO of InfrastructureWorld, Inc., a business-to-business portal for the global infrastructure community. Mr. Hull also serves as a Director of Darby Overseas Investments, Ltd., Bechtel Group, Inc., Bechtel Enterprises and the Fremont Group. On February 2, 2001, stockholders approved an increase in the number of authorized shares of common stock from 100 million to 500 million, allowing Gilead to complete a two-for-one stock split in the form of a stock dividend. As a result of the split, the number of outstanding shares of Gilead's Common Stock increased to approximately 94 million. Gilead will host a conference call today, April 26, 2001, at 4:30 p.m. ET. The dial-in number for the call is 888-937-3116 domestic; 212-346-7495 international. The replay of this call will be available from 7:00 p.m. April 26, 2001, until 7:00 p.m. on April 29, 2001. The dial-in number for the replay is 800-633-8284 domestic, 858-812-6440 international; the password is 18466849. Gilead also will be webcasting the conference call; this feature will be available on our website at www.gilead.com. The information provided on the teleconference and on the webcast is only accurate at the time of the call, and Gilead will take no responsibility for providing updated information. Gilead Sciences, Inc., headquartered in Foster City, CA, is an independent biopharmaceutical company that seeks to provide accelerated solutions for patients and the people who care for them. Gilead discovers, develops, manufactures and commercializes proprietary therapeutics for challenging infectious diseases (viral, fungal and bacterial infections) and cancer. Gilead maintains research, development or manufacturing facilities in Foster City, CA; Boulder, CO; San Dimas, CA; Cambridge, UK, and Dublin, Ireland, and sales and marketing organizations in the United States, Europe and Australia. Statements included in this press release that are not historical in nature are "forward-looking statements" within the meaning of the Private Securities Litigation Reform Act of 1995. These statements include those regarding Gilead's future financial results, including: revenues, research and development expenses, selling, general and administrative expenses, the efficacy of any marketed or pipeline development products, the ability to file for or obtain marketing approval for Gilead's pipeline development products, or the competitive positioning of its marketed or pipeline development products. Gilead cautions readers that forward-looking statements are subject to certain risks and uncertainties, which could cause actual results to differ materially. These risks and uncertainties include those that can cause fluctuations in our financial results, such as our ability and the ability of our partners to successfully market our products and maintain revenue growth; our ability to control the timing and amount of spending in our research and clinical programs; fluctuations in foreign currency against the U.S. dollar; our ability to achieve and the timing of milestones, as well as risk and uncertainties that affect our future prospects such as the risk that we may not continue to observe the safety, tolerability and efficacy data for our products and product candidates that we are observing today; other risks relating to the regulatory approval of our products and product candidates; and other risks identified from time to time in the company's reports filed with the U.S. Securities and Exchange Commission. The company directs readers to its Annual Report on Form 10-K, for the year ended December 31, 2000, filed in March 2001, and its 2000 Quarterly Reports on Form 10-Q filed with the SEC. Gilead claims the protection of the Safe Harbor contained in the Private Securities Litigation Reform Act of 1995 for forward-looking statements. All forward-looking statements are based on information currently available to Gilead, and Gilead assumes no obligation to update any such forward-looking statements. For more information on Gilead Sciences, please visit the company's Web site at www.gilead.com or call the Gilead Corporate Communications Department at 1-800-GILEAD-5 (1-800-445-3235).